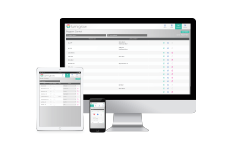 The ability to control intensity and spectrum has proven vital to commercial plant propagation. Research by major institutions and the LumiGrow Research Group has proven that changes in spectrum can be used to improve plug quality and reduce time to rooting. 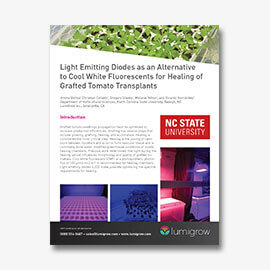 When grafting, LumiGrow LEDs can be used to produce more uniform plants, and speed up the healing process. 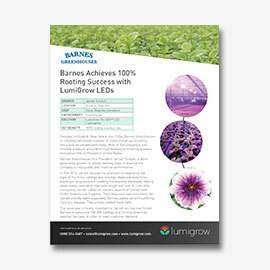 Barnes Greenhouses, a floral propagator achieves 100% rooting success with LumiGrow LEDs. Learn how grafted tomato seedling production can be optimized using light spectra.